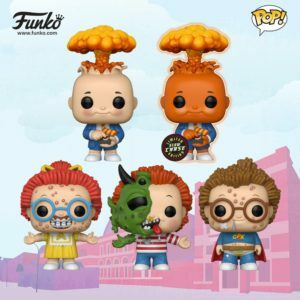 Funko has officially announced the Garbage Pail Kids Pop! Vinyl figures. Information on these regular sized figures started leaking out a few weeks ago, but now we have more information from Funko. The pictures of the figures was revealed in Funko’s blog in association with the London Toy Fair. There will be 4 regular figures, (Adam Bomb, Clark Can’t, Ghastly Ashley, and Beastly Boyd), and one chase Adam Bomb figure. It appears the chase Adam Bomb will be glow in the dark. The company says on the blog the figures will be out in May.